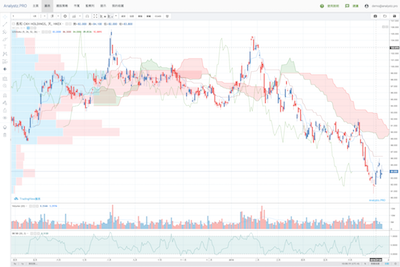 香港期權分佈, 不同行使價之“成交量”及“未平倉合約”分佈。Hong Kong options distribution table, with volume and open interests distribution for different strike prices. 期權最痛, 以現時未平倉合約計算出沽家最佳結算價位(價內期權總值為最低)。Calculate the total ITM options moneyness for each of the Strike Prices at the settlement day. 期權異動搜尋, 以“成交量”及“未平倉合約”去搜尋不同月份之期權合約。Search options contracts by volume and open interests. 列出各牛熊證的街貨量百分比, 相應對沖期指張數, 同時列出多個交易日, 方便分析比較。For each of the CBBC, showing the O/S percentage and the corresponding number of HSI futures. List in multiple days format, easy to compare and analyse. 列出各回收價之即將發行牛熊證數目, 多個交易日同列, 方便分析比較。Showing the total up-coming CBBC number by each of the Call Level. List in multiple days format, easy to compare and analyse. 以最新沽空金額或沽空比率與過去平均值比較, 篩選異動沽空股票，可自行調節參數。Compare the latest short selling turnover or short selling ratio with the previous average value, search for the unusual short selling stocks. Parameters fine tuning available. 股票沽空比率, 列出. 以圖表顯示, 方便分析比較。Short selling ratio of , include the historical records and display in chart. 沽空比率排名, 比較港股沽空比率, 多個交易日同列, 方便分析比較。Stock short selling ratio ranking, list in multiple days format, easy to compare and analyse. 恆指沽空比率, 分析恆生指數成分股之沽空比率, 了解大戶步署, 從而推敲後市。By analysing the short selling ratio of the Hang Seng Index Constituents, forecast the latest market trend. 香港股票成交量分佈(蟹貨區), 列出個股在一段日子內各個不同價位的成交量。在同一價位中越多成交，表示越多投資者認同此價位，買賣越激烈，成為支持或阻力位的機會越高。 Volume Profile for Hong Kong Traded Stocks. 異動股搜尋, 以最新成交額或成交量與過去平均值比較, 篩選異動股票，可自行調節參數。 Compare the latest transaction turnover or volume with the previous average value, search for the extraordinary transaction stocks. Allow parameters fine tuning. 移動平均線交叉搜尋, 搜尋出現黃金交叉或死亡交叉之股票，可自行調節參數。 Filtering Hong Kong stocks by different values of moving average crossovers. Allow parameters fine tuning. 相對強弱指數(RSI), 超買?超賣?一目了然! 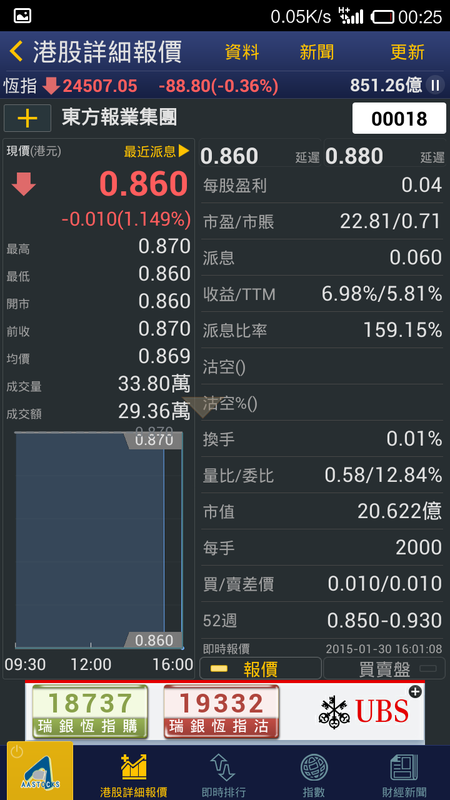 搜尋相對強弱指數(RSI)大於或小於自定值之股票，可自行調節參數。Search for Oversold/Overbought stocks with Relative Strength Index (RSI). Allow parameters fine tuning. 監察董事或管理層的股份變動。因他們對公司的營運情況十分了解。何時增持或減持往往對股價有啟示作用。Monitoring the top managements or directors' shareholding changes. 利用多項技術指標, 同時監察所有恆指成份股的超買超賣水平, 一圖縱觀大勢. Monitoring all the HSI Constituents by utilizing various common stock technical indicators, in a single dashboard. 統計每天高於平均線的股票比例, 監察大市強弱。HSI Market Breadth, counting the number of stocks above the moving averages, monitoring the market performance. 港股升跌比例, 統計每天大市上升及下跌的股票比例, 更可與恆生指數升跌比例比較, 監察市底強弱。Counting the number of rising and dropping stocks in the stock market, monitoring the market performance. 恆生指數的“市盈率”及“派息率”的歷史數據圖表. Historical records and chart of Hang Seng Index, HSI PE ratio and dividend. 銀行同業拆息, 香港銀行同業拆息的歷史數據圖表。Historical records and charts of HIBOR. Disclaimer : All information and data are provided "as is" for informational purposes only, and are not intended for trading purposes or advice. Data are delayed by financial exchanges or data providers. Analystz.HK has not reviewed the data and in no way endorse the validity of the data. Analystz.HK, its data providers, the financial exchanges and each of their affiliates do not guarantee the accuracy or reliability of the data and accept no liability (whether in tort or contract or otherwise) for any loss or damage arising from any inaccuracies or omissions. Copyright © 2009-2019 Analystz. All Rights Reserved.